Annunciation's here, which is being updated daily. This sight will continue to host some alternate postings, photos, and videos that are easier to post on Blogger. The How to Book of the Mass by Michael Dubruiel would be a great gift for a newly-confirmed Catholic. And the Sacraments, here is the complete set of Father Mitch Pacwa's presentations given at the Cathedral of Saint Paul in Birmingham, AL from September 4, 2008-October 9, 2008. September 4, 2008, on Saint Paul and Baptism. September 11, 2008 on Saint Paul and Confession. But until then check out Annunciation here, which is being updated daily. One writes about life, the other about sports. Today is National Punctuation Day, a day set aside to reflect on the fact a semicolon is not a medical problem. At least that's what NPD founder Jeff Rubin, a former newspaperman, wants to impart. I hesitate to write about punctuation since it has never been my strong suit. Commas especially. Or is it commas, especially? Because of my comma condition, I have driven more than a few editors crazy, which is not necessarily a bad thing. "Weren't you ever taught about commas?" one editor barked at me early in my newspaper career. "No," I answered. "I was sick that day." And so he would insert commas where commas belonged, and we went to press. After that, I would put commas most everywhere. Like, after, every, word. Just for good measure. Then another editor would bark at me. "Was there a sale on commas somewhere?" she would ask. "I guess there was," I would reply. And then she would go back, remove most of them, and we went to press. I would then go back to never putting a comma in any sentence no matter how long laborious lovely or lively. Correct punctuation, like good conversation, has become a lost art. That's why Rubin began NPD a few years ago. E-mail has not helped any, mainly because it's often communication through sentence fragments. Dashes and ellipses galore. Maybe that's why I use lots of exclamation points in my e-mail. It's not that my sentence fragments are exciting. I'm just trying to make them so. Like this! My journalism professor, who loathed exclamation points, is rolling in his grave, and if he's not there yet, I'm sure an e-mail from me could send him there. His rule: Never use an exclamation point unless the sentence is about the end of the world, and the end of the world is tomorrow. Example: The end is near! F. Scott Fitzgerald understood the exclamation point. He said, "An exclamation mark is like laughing at your own jokes." I'll try to remember that. I'll also try to remember the rule about semicolons. I've used them on occasion, but once an editor removed one from a story. He called it pretentious. He said a period worked just as well. He was right, of course. We hate nothing more (please insert exclamation point). Once when I was a columnist in Gainesville, I picked the Gators to lose a big game against Tennessee. The following week, I received an aromatic letter in the mail. One disgruntled reader, upset with my prediction, literally used my column as toilet paper, stuck it in an envelope and mailed it to me with this message: "I have to put up with your $#!#! Now you have to put up with mine!" Maybe it's appropriate that there's a checkerboard pattern in Tennessee's end zone. Fulmer is indeed playing checkers. The problem is Meyer is playing chess. The reflection prior to the Marian prayer, in the courtyard of Castel Gandolfo, was dedicated to commenting on today's Gospel, for the 25th Sunday in Ordinary Time, which presents "the parable of the owner of the vineyard, who at different hours of the day calls laborers to work in his vineyard" (Mt. 20:1-6a). "One message of this parable", the pope explained, "lies in the fact that the owner does not tolerate unemployment, so to speak: he wants everyone to be busy in his vineyard. And in reality, being called is itself a form of compensation: being able to work in the vineyard of the Lord, putting oneself at his service, collaborating in his work, constitutes an inestimable reward in itself, which repays any hardship. But only those who love the Lord and his Kingdom understand this; those who instead work only for payment will never realize the value of this inestimable treasure". Benedict XVI numbers St Matthew, whose liturgical feast is celebrated today, among these "workers in the vineyard": "Before Jesus called him", the pontiff said, "he was a tax collector, and for this reason he was considered a public sinner, excluded from the 'vineyard of the Lord'. But everything changed when Jesus, passing nearby his customs post, saw him and told him: 'Follow me'. Matthew got up and followed him. He immediately changed from being a tax collector to being a disciple of Christ. Instead of being 'last', he found himself 'first', thanks to the logic of God, which - fortunately for us! - is different from that of the world". Another "worker" is St Paul: "St Paul, whom we are celebrating in a special way with a jubilee year, also experienced the joy of hearing himself called by the Lord to work in his vineyard. And what work he did! But, as he himself confesses, it was the grace of God working in him, the grace that transformed him from being a persecutor of the Church to being an apostle of the Gentiles. So much so, that he said: 'For to me life is Christ, and death is gain'. But he immediately adds: 'If I go on living in the flesh, that means fruitful labor for me. And I do not know which I shall choose' (Phil. 1:21-22). Paul understood well that working for the Lord is already a reward on this earth". Benedict XVI did not overlook himself, and recalled that at the Mass on the very day of his election, at St. Peter's, "I was prompted spontaneously to present myself as a worker in the vineyard of the Lord". I was walking down the street the other day and started counting the number of people coming toward me who were talking on cellphones. It got up to 10 before one sad sack came along who was walking with only his thoughts. But 10 in a row were on phones. Two of them were walking next to each other, so I assumed they were together. Maybe they were even talking to each other. Who knows? All I know is there's too much communicating going on these days. If communication were such a good thing, wouldn't the world be in a better state? Isn't communication supposed to translate into understanding? At least the exchange of useful information? A friend confessed the other day that she talks to her son who is away at college five or six times a day. At least I think she said five or six times a day. I could hardly hear her over the roar of her helicopter. Does she call to wake him up? Do they talk after every class? Does he call when he's heading to lunch? Does she call after lunch and ask what he had for lunch? Maybe he calls during lunch to ask what he should have for lunch. Who knows? All I know is it's too much information. What's the point of being away at college if your parents know everything that's going on? That used to be the whole point, didn't it? Your parents didn't have a clue what was happening on campus. I think even they liked it that way. The less known, the better. When I was in college, I used to communicate with my folks once a week. It was always on Sunday night, and it was always after 6 or 7 when the rates went down. I remember because there was always a line at the phone booth on my dorm floor that night. It got a little funky in there behind those glass doors after the seventh or eighth guy made his call home, but that's the way the world worked. Lots of things were funky back then. I would always call collect, my parents would always accept, and then we would talk about the important issues of the day. The weather mainly. Yes, it snowed again. Yes, we're expecting more snow tonight. I asked after the dog. I'd tell them if I'd snagged a ride home for Thanksgiving. I might have mentioned a class now and then, but I doubt it. I don't ever remember telling them what was really going on. The whole conversation lasted less than 10 minutes, nothing much was said, everyone hung up happy, and we repeated the whole process a week later. In short, communication the way it should be. In the Mass, we want to belong only to Christ and we take up with gratitude – with thanksgiving – the cry of the psalmist: "How shall I repay the Lord for his goodness to me?" (Ps 116:12). Yes, how can I give thanks to the Lord for the life he has given me? The answer to the psalmist’s question is found in the psalm itself, since the word of God responds graciously to its own questions. How else could we render thanks to the Lord for all his goodness to us if not by attending to his own words: "I will raise the cup of salvation, I will call on the name of the Lord" (Ps 116:13)? With a complete overturning of the Marxist theory on religion as the "opium of the people", and of Enlightenment rationalism, on the uselessness of God in life, Benedict XVI today claimed that Christ, the Eucharist, the Mass, help man to free himself from the "idols" that, as in ancient paganism, "constituted a powerful source of alienation and diverted man from his true destiny". And precisely in order to free man from the prison of the idols, the pope invited the young people to follow the call to the priestly and religious vocation. On the second day of his visit to France, the pontiff celebrated the Mass in the Esplanade des Invalides, with almost 300,000 people: the attendance exceeded all of the predictions, almost as if to disprove all of the theories about the secularization dominating the country, once called the "eldest daughter of the Church". In his homily, the pope commented on the readings of the liturgy for the feast of of Saint John Chrysostom, one of the greatest fathers of the Church, from the fourth century, who left works of catechesis, liturgy, and theology that are still kept alive in both East and West. Beginning with the appeal from the apostle Paul to "Shun the worship of idols" (1 Cor. 10:14), the pontiff explained what idols are: "The word 'idol' comes from the Greek and means 'image', 'figure', 'representation', but also 'ghost', 'phantom', 'vain appearance'. An idol is a delusion, for it turns its worshipper away from reality and places him in the kingdom of mere appearances. Now, is this not a temptation in our own day – the only one we can act upon effectively? The temptation to idolize a past that no longer exists, forgetting its shortcomings; the temptation to idolize a future which does not yet exist, in the belief that, by his efforts alone, man can bring about the kingdom of eternal joy on earth! . . . Have not money, the thirst for possessions, for power and even for knowledge, diverted man from his true destiny?" Benedict XVI recalled that the condemnation of idolatry is the condemnation of sin, but not of the sinner; on the contrary, man is called to truth and to conversion, to discover God through the use of reason. But "How do we reach God?". "Communion with the Body of Christ", the Eucharist, is the means by which we are helped to free ourselves from idols, because we discover the true face of God: "Millions of times over the last twenty centuries, in the humblest chapels and in the most magnificent basilicas and cathedrals, the risen Lord has given himself to his people, thus becoming, in the famous expression of Saint Augustine, 'more intimate to us than we are to ourselves' (cf. Confessions, III, 6, 11)". And again: "The Mass invites us to discern what, in ourselves, is obedient to the Spirit of God and what, in ourselves, is attuned to the spirit of evil". "He alone [Christ present in the Eucharist] teaches us to shun idols, the illusions of our minds". The urgency of celebrating the Eucharist as an instrument of truth for the faithful and for the world impelled the pope to make an appeal to the young people: "Do not be afraid! Do not be afraid to give your life to Christ! Nothing will ever replace the ministry of priests at the heart of the Church! Nothing will ever replace a Mass for the salvation of the world! Dear young and not so young who are listening to me, do not leave Christ’s call unanswered". His final invitation was to mission, to communicate the faith in truth and love with those around us: "When we speak, do we seek the good of our interlocutor? When we think, do we seek to harmonize our thinking with God’s thinking? When we act, do we seek to spread the Love which gives us life?" And he concluded: "I entrust you, dear Christians of Paris and France, to the powerful and merciful action of the God of love who died for us upon the Cross and rose victorious on Easter morning. To all people of good will who are listening to me, I say once more, with Saint Paul: Shun the worship of idols, do not tire of doing good! May God our Father bring you to himself and cause the splendour of his glory to shine upon you! ". Father Mitch Continues Teaching on Saint Paul Tonight! Father Mitch Pacwa, continues a series on Saint Paul in St. Paul's Cathedral in Birmingham, AL, begining tonight at 7:00 P.M. Everyone is invited, there is no admission or registration. This series will continue for the next five weeks. Father Mitch will be available after the talk to autograph books and answer questions. The video of last week's talk is on this web page. Just below this post. Check out Ignatius Productions for more details! The Pauline concept of apostleship went "beyond that of the group of Twelve" explained the Holy Father. "It was characterised by three elements: the first was the fact of having seen the Lord, in other words of having encountered Him in a way that marked his life. ... Definitively then, it is the Lord Who confers the apostolate, not individual presumption. Apostles do not make themselves but are created so by the Lord". The second characteristic is that of "having been sent. In fact, the Greek term 'apostolos' means envoy, ... the representative of a principal. ... Once again the idea emerges of an initiative arising from someone else, from God in Jesus Christ, to Whom one is duty-bound", of "a mission to be accomplished in His name, putting all personal interests aside". "Announcing the Gospel and the consequent founding of Churches" is the third requisite. "The tile of apostle", said Pope Benedict, "is not and cannot be a merely honorary title. It truly, even dramatically, involves the entire existence of the person concerned". St. Paul also defined apostles as "servants of God, Whose grace acts in them", said the Pope. "A typical element of the true apostle ... is a form of identification between the Gospel and the evangeliser, both share the same destiny. Indeed no-one so much as Paul highlighted how announcing the cross of Christ is a 'stumbling block and foolishness' to which many react with misunderstanding and refusal. That happened then and it should be no surprise that the same thing happens today". "With the stoical philosophy of his time, Paul shared the idea of tenacious perseverance in all the difficulties he had to face; but he went beyond the merely human perspective by recalling ... God's love and Christ's. ... This is the certainty, the profound joy that guided the Apostle though all those events: nothing can separate us from the love of God, and this love is the real treasure of human life". "As we may see, St. Paul gave himself to the Gospel with all his life", said the Holy Father in conclusion. "He undertook his ministry with faithfulness and joy that he 'might by all means save some'. And though aware of his own relationship of paternity - even, indeed, of maternity - towards the Churches, his attitude to them was one of complete service, declaring: "I do not mean to imply that we lord it over your faith; rather, we are workers with you for your joy'. This remains the mission of all the apostles of Christ in all times: to be collaborators of true joy". On August 24, Speaker of the House Nancy Pelosi, describing herself as an ardent, practicing Catholic, misrepresented the overwhelming body of Catholic teaching against abortion to the show's nationwide audience, while defending her "pro-choice" abortion views. On September 7, Sen. Joseph Biden compounded the problem to the same Meet the Press audience. Sen. Biden is a man of distinguished public service. That doesn't excuse poor logic or bad facts. Asked when life begins, Sen. Biden said that, "it's a personal and private issue." But in reality, modern biology knows exactly when human life begins: at the moment of conception. Religion has nothing to do with it. People might argue when human "personhood" begins - though that leads public policy in very dangerous directions - but no one can any longer claim that the beginning of life is a matter of religious opinion. Sen. Biden also confused the nature of pluralism. Real pluralism thrives on healthy, non-violent disagreement;it requires an environment where people of conviction will struggle respectfully but vigorously to advance their beliefs. In his interview, the senator observed that other people with strong religious views disagree with the Catholic approach to abortion. It's certainly true that we need to acknowledge the views of other people and compromise whenever possible - but not at the expense of a developing child's right to life. Abortion is a foundational issue; it is not an issue like housing policy or the price of foreign oil. It always involves the intentional killing of an innocent life, and it is always, grievously wrong. If, as Sen. Biden said, "I'm prepared as a matter of faith [emphasisadded] to accept that life begins at the moment of conception," then he is not merely wrong about the science of new life; he also fails to defend the innocent life he already knows is there. As the senator said in his interview, he has opposed public funding for abortions. To his great credit, he also backed a successful ban on partial-birth abortions. But his strong support for the 1973 Supreme Court decision Roe v. Wade and the false "right" to abortion it enshrines, can't be excused by any serious Catholic. Support for Roe and the "right to choose" an abortion simply masks what abortion is, and what abortion does. Roe is bad law. As long as it stands, it prevents returning the abortion issue to the states where it belongs, so that the American people can decide its future through fair debate and legislation. Catholics have been hearing for 40 years: i.e., that Catholics can't "impose" their religiously based views on the rest of the country. But resistance to abortion is a matter of human rights, not religious opinion. And the senator knows very well as a lawmaker that all law involves the imposition of some people's convictions on everyone else. That is the nature of the law. American Catholics have allowed themselves to be bullied into accepting the destruction of more than a million developing unborn children a year. Other people have imposed their "pro-choice" beliefs on American society without any remorse for decades. Father Mitch Pacwa at Birmingham Cathedral Tonight! Father Mitch Pacwa, will present a series on Saint Paul in St. Paul's Cathedral in Birmingham, AL, begining tonight at 7:00 P.M. Everyone is invited, there is no admission or registration. This series will continue for the next six weeks. Father Mitch will be available after the talk to autograph books and answer questions. Christianity "is not a philosophy or a moral norm; we are Christians only if we encounter Jesus". As for Paul on the road to Damascus, this encounter changes both our way of thinking and our life itself, clearing away what was essential up until that moment, while it is "only life in Christ that matters". To the 8,000 people present today in the audience hall at the Vatican, Benedict XVI again spoke of the figure of St Paul. Last week, he had sketched out his biography, while today he dwelt upon the meaning of the "experience on the road to Damascus, what is commonly called his conversion". "The decisive moment in Paul's life took place during the third decade of the first century. Much has been written about this from various points of view, and it is certain that here there was a turning point, a change of perspective". "He began to think about everything that had constituted the reason for his existence up until then as a waste of time, as rubbish". The pope recalled that Luke narrates the event in three sections of the Acts of the Apostles. "The average reader", he adds, "dwells upon the details, like the light from the sky, the fall, the blindness . . ." But these details "are all related to the center of this episode: the Risen One appears like a splendid light and speaks to Saul; he transforms his way of thinking and his life itself". In the ancient Church, baptism was also called illumination, because it makes us see the light. "What is referred to theologically takes place physically for Paul. Paul was transformed not by any thought of his own, but by an event, by the presence of the Risen One. This encounter is the center of Luke's account; it changed [Paul's] life, and in this sense it can be called a conversion". St Paul himself speaks of his "conversion" in his letters. "He never talked about the details", Benedict XVI emphasized, "and I think this is because he was able to assume that everyone knew the story about how he was changed from a persecutor into a disciple". "Although he does not speak about the details, he mentions various times that he, too, is a witness of the Resurrection of Jesus, from whom he received directly his mission as an Apostle". The pope cited the letters to the Romans, the Corinthians, and the Galatians in this regard. In the latter of these, in particular, Paul talks about when "he who chose me from my mother's womb" called him to proclaim him among the pagans, and thus he "emphasizes that he is also a true witness of the Risen One" and "has his own mission, received directly from Jesus". "This new direction for his life", the pope emphasized, "was not the result of a psychological process, of a moral and intellectual maturation, but came from the outside; it was not the result of his maturation, but of his encounter with Christ, an event that transformed him". "in this sense, he died, and the resurrection was his own as well; the past was dead, and he rose with the risen Christ". "No amount of psychological analysis can clarify this, only the event itself; the encounter is the key for understanding what happened. In this deeper sense, we may speak of a conversion, of a real event that changed all of the standards; what had been essential is now rubbish, and only life in Christ matters". This means that Christianity is not a new philosophy or a moral norm for us either; we are Christian only if we encounter Jesus". "Of course, he does not appear to us in this dazzling, irresistible way. but we can encounter him in the liturgy, in life with the Church". "It is only in this personal relationship with the Risen One that we truly become Christians, and thus open our reason to all of the wisdom of Christ, to all of the richness of the truth". "Let us ask", he concluded, "for the gift of a lively faith, for a large and open heart, for a charity for all of that renews the world". Spotted on the streets of Birmingham, AL--the Sister Servants of Mary from New Orleans, here in exile waiting out Hurricane Gustav. “Dear brothers and sisters, to fully achieve the work of salvation, the Redeemer continues to have men and women join him and his mission in taking the cross and following him. What Did Saint Augustine Really Say? Abortion: Augustine, in common with most other ecclesiastical writers of his period, vigorously condemned the practice of induced abortion. Procreation was one of the goods of marriage; abortion figured as a means, along with drugs which cause sterility, of frustrating this good. It lay along a continuum which included infanticide as an instance of "lustful cruelty" or "cruel lust" (nupt. et conc. 1.15.17). Augustine called the use of means to avoid the birth of a child an "evil work": a reference to either abortion or contraception or both (b. conjug. 5.5). Augustine accepted the distinction between "formed" and "unformed" fetuses found in the Septuagint version of Exodus 21:22-23. While the Hebrew text provided for compensation in the case of a man striking a woman so as to cause a miscarriage, and for the penalty to be exacted if further harm were done, the Septuagint translated the word "harm" as "form," introducing a distinction between a "formed" and an "unformed" fetus. The mistranslation was rooted in an Aristotelian distinction between the fetus before and after its supposed "vivification" (at forty days for males, ninety days for females). According to the Septuagint, the miscarriage of an unvivified fetus were vivified, the punishment wa a capital one. Augustine disapproved of the abortion of both the vivified and unvivified fetus, but distinguished between the two. The unvivified fetus died before it lived, while the vivified fetus died before it was born (nupt. et con. 1.15.17). In referring back to Exodus 21:22-23, he observed that the abortion of an unformed fetus was not considered murder, since it could not be said whether the soul was yet present (qu. 2.80). The question of the resurrection of the fetus also exercised Augustine, and sheds some light on his views on abortion. Here again he referred to the distinction between the formed and unformed fetus. Though he acknowledged that it was possible that the unformed fetus might perish like a seed, it was also possible that, in the resurrection, God would supply all that was lacking in the unformed fetus, just as he would renew all that was defective in an adult. This notion, Augustine remarked, few would dare to deny, though few would venture to affirm it (ench. 33.85). At another point Augustine would neither affirm nor deny whether the aborted fetus would rise again, though if it should be excluded from the number of the dead, he did not see how it could be excluded from the resurrection (civ. Dei 22.13). --from John C. Bauerschmidt, "Abortion", in Augustine Through The Ages: An Encyclopedia , edited by Fr. Alan Fitzgerald, OSA, p. 1. To learn more about Christian history, read more about the Catholic Mass here. Today, he sketched a biography of the apostle to the gentiles, leaving the subject of his conversion, "the fundamental turning point of his life", until next Wednesday. Benedict XVI first highlighted that Paul - born in Tarsus, probably in the year 8 - "spoke Greek, even though he had a name of Latin or Roman origin". He was "a meeting point of three cultures" - Jewish, Greek, and Roman - "and perhaps for this reason as well was able to mediate between cultures, in a true universality". Paul was educated in Jerusalem by the rabbi Gamaliel, "according to the strictest norms of the Pharisees", for which reason he believed in a "profound orthodoxy that saw a risk, a threat in the man called Jesus". "This explains the fact that he clearly persecuted the Church of God. He was on the road to Damascus precisely in order to prevent the spread of this sect, as he himself said". From that moment, the persecutor of Christianity "became a tireless apostle of the Gospel, and passed into history for what he did as a Christian, or rather as an apostle". The pope then recalled his apostolic activity, which "is subdivided on the basis of the three missionary voyages, to which is added a fourth, when he was taken to Rome as a prisoner". Among the various moments in Paul's life, Benedict XVI recalled his famous speech in the agora in Athens: "In the ancient cultural capital, he preached to the pagans and Greeks. In the agora, he gave a model speech for explaining to the Greeks that this God is not foreign and unknown, but one they had been waiting for, the deepest response to their anticipation". In conclusion, Saint Paul "dedicated himself to the proclamation of the Gospel, without holding anything back", making himself, as he wrote, "the servant of all, confronting harsh trials". "I do everything", he said, "for the sake of the Gospel". "This commitment", the pope said, "can be explained only by a soul that is enraptured with the light of Christ", by the conviction that "it is truly necessary to proclaim the light of Christ to the world, to give a glimpse of the beauty and necessity of the Gospel for all of us". "Let us ask", he concluded, "that the Lord may show his light to us as well, and that we may also give the world the light of the Gospel, the truth of Christ". All persons, not just Catholics, can know from the scientific and medical evidence that what grows in a mother's womb is a new, distinct human being. All persons can understand that each human being -- without discrimination -- merits respect. At the very least, respecting human life excludes the deliberate and direct destruction of life -- and that is exactly what abortion is. Catholics are also pro-life because our Christian tradition is pro-life. As Pope John Paul II says, Christians believe that "all human life is sacred, for it is created in the image and likeness of God." Aborting an unborn child destroys a unique creation which God has called specially into existence. Christian teaching also obliges us to follow in the footsteps of Jesus Christ, who spoke and acted strongly and compassionately in favor of the most despised and vulnerable persons in society. Jesus touched lepers, spoke with prostitutes, and showed special mercy and tenderness to the sick, the poor, and children. Our society today has many vulnerable persons --- including women in crisis pregnancies as well as unborn children whose lives may be legally ended at any time during pregnancy and for any reason. In the tradition of Jesus Christ, Catholics have a responsibility to speak and act in defense of these persons. This is part of our "preferential option" for the poor and powerless. The Church's mission to defend human life applies over the entire course of life, from conception to natural death. And so the Catholic Church has been a strong supporter of the civil rights movement and a leader in international relief and development efforts. Catholic hospitals and other health-care facilities form the largest network of private, not-for-profit health care providers in the United States. Catholic Charities USA --- one of a number of Catholic charitable groups --- is currently the single largest provider of social services to all Americans, regardless of race, creed or national origin. The Catholic Church strives to be a prophetic voice, speaking out to protest injustices and indignities against the human person. Catholics will continue in this work, whether our words are popular or unpopular. Since its beginnings, Christianity has maintained a firm and clear teaching on the sacredness of human life. Jesus Christ emphasized this in his teaching and ministry. Abortion was rejected in the earliest known Christian manual of discipline, the Didache. Early Church fathers likewise condemned abortion as the killing of innocent human life. A third century Father of the Church, Tertullian, called it "accelerated homicide." Early Church councils considered it one of the most serious crimes. Even during periods when Aristotle's theory of "delayed ensoulment" led Church law to assign different penalties to earlier and later abortions, abortion at any stage was still considered a grave evil. When biologists in the 19th century learned more about the process of conception, the Church altered its legal distinction between early and late abortions out of respect for reason and biology. Since that time, science has only further confirmed the humanity of the child growing in the womb. Official Church teaching insists, to the present day, that a just society protects life before as well as after birth. "The first right of the human person is his life . . . It does not belong to society, nor does it belong to public authority in any form to recognize this right for some and not for others; all discrimination is evil. . . Any discrimination based on the various stages of life is no more justified any other discrimination. . . . In reality, respect for human life is called for from the time that the process of generation begins. From the time that the ovum is fertilized, a life is begun which is neither that of the father nor of the mother; it is rather the life of a new human being with his own growth. "Declaration on Procured Abortion, Congregation for the Doctrine of the Faith (1974), paragraphs 11-12. Pro-Life Activities 3211 4th Street, N.E., Washington DC 20017-1194 (202) 541-3000 © USCCB. All rights reserved. Our Lady of Sorrows, Birmingham AL at 10:00 a.m.
Holy Spirit Parish, Huntsville, AL at 6:00 p.m. Following the Apostle’s confession of faith Jesus conferred upon Peter his mandate (And so I say to you, you are Peter, and upon this rock I will build my church, and the gates of the netherworld shall not prevail against it. I will give you the keys to the kingdom of heaven.). “It is the first time that Jesus spoke about the Church whose mission is to implement God’s grandiose plan to unite in Christ the whole of humanity as a single family. Peter’s mission, and that of his successors, is to serve the one and only Church of God, which includes Jews and pagans. Its indispensable ministry is to ensure that it does not identify with any one nation or culture, but that it is a Church for all peoples, so as to make present among people, who suffer from countless divisions and contrasts, God’s peace and the renewing strength of his love. It must therefore serve the inner unity that comes from God’s peace, the unity of those who have become brothers and sisters of Jesus Christ. This is the unique mission that falls upon the Pope, Bishop of Rome, Successor of Peter. - LOUIS MARTIN E ZÉLIE MARIE GUÉRIN, laici, sposi e genitori: Domenica 19 ottobre 2008, a Lisieux (Francia), nella Basilica di Santa Teresa del Bambino Gesù, alle ore 10. In his reflection before the Angelus, he commented on the liturgy of the 20th Sunday in ordinary time, in which "the universality of salvation" is emphasized in various ways: "The Word of God thus offers us the opportunity to reflect on the universality of the mission of the Church, made up of peoples of every race and culture. This is the origin of the great responsibility of the ecclesial community, which is called to be a house of welcome for all, the sign and instrument of communion for the entire human family". The pope said that "it is important, above all in our time, that every Christian community deepen this awareness more and more, in part for the sake of helping civil society to overcome any temptation of racism, intolerance, and exclusion, and to organize itself with decisions respectful of the dignity of every human being! One of the great achievements of humanity is, in fact, precisely the overcoming of racism. Unfortunately, however, there are worrying new signs of this in various countries, often connected to social and economic problems, which nonetheless can never justify disrespect and racial discrimination. Let us pray that respect for every person may increase everywhere, together with the responsible awareness that only in the reciprocal welcome of all is it possible to build a world marked by authentic justice and true peace". Benedict XVI then dedicated a thought - and a prayer intention - to all the victims of vehicles or accidents in recent days (especially in Italy). "We must not", the pontiff said, "grow accustomed to this sad reality! Human life is too valuable, and it is unfit for man to die or be crippled by causes that, in most cases, could be avoided. A greater sense of responsibility is certainly necessary. Above all on the part of drivers, because accidents are often due to excessive speed and imprudent behavior. Driving a vehicle on the public roads requires a moral sense and a civic sense. In promoting the latter of these, a constant effort of prevention is indispensable, the vigilance and deterrence on the part of the competent authorities. As the Church, in fact, we feel ourselves directly involved on the ethical level: Christians first of all must make a personal examination of conscience of their own conduct as drivers; the communities should moreover educate all to consider driving as an area in which to defend life and concretely exercise love of neighbor". WASHINGTON (CNS) -- In the not-too-distant future, songs such as "You Are Near," "I Will Bless Yahweh" and "Rise, O Yahweh" will no longer be part of the Catholic worship experience in the United States. At the very least, the songs will be edited to remove the word "Yahweh" -- a name of God that the Vatican has ruled must not "be used or pronounced" in songs and prayers during Catholic Masses. Bishop Arthur J. Serratelli of Paterson, N.J., chairman of the U.S. bishops' Committee on Divine Worship, announced the new Vatican "directives on the use of 'the name of God' in the sacred liturgy" in an Aug. 8 letter to his fellow bishops. He said the directives would not "force any changes to official liturgical texts" or to the bishops' current missal translation project but would likely have "some impact on the use of particular pieces of liturgical music in our country as well as in the composition of variable texts such as the general intercessions for the celebration of the Mass and the other sacraments." John Limb, publisher of OCP in Portland, Ore., said the most popular hymn in the OCP repertoire that would be affected was Dan Schutte's "You Are Near," which begins, "Yahweh, I know you are near." He estimated that only "a handful" of other OCP hymns use the word "Yahweh," although a search of the OCP Web site turned up about a dozen examples of songs that included the word. OCP is a nonprofit publisher of liturgical music and worship resources. The lunch took place July 18 at Pell's residence in Sydney. Cervantes and the others were led into a room with a circular table. Place cards directed them where to sit. Security guards swept through the room, then the group was told to wait: The Holy Father would be with them shortly. "All of us didn't know what to say," Cervantes recalled. They joked about not knowing which fork to use and warned those who would be seated next to the pope not to accidentally use his bread plate. They also peeked through the drawn blinds, hoping to catch a glimpse of the pope arriving. When Benedict arrived with Pell, the two men quickly put the young delegates, who were all in their 20s, at ease. Share who you are and what you do, the pope told them. Cervantes had memorized facts about his diocese and it was clear the other diners had also prepared facts to share. But that's not what the pope wanted. "He would bring us back to talk about us," Cervantes said. He talked about his parents, both immigrants, and his work in youth ministry. The pope asked their names and where they had come from, and if Cervantes had siblings. "I didn't think he would ask any of that," Cervantes said. But he answered the questions. His parents, Alicia and Fermin Cervantes, immigrated from Mexico. He has a sister, Vivian, and a brother, Miguel. The pope also asked about Orange County and if the church was multicultural. Benedict seemed pleased, Cervantes said, when he talked about the large presence of Spanish- and Vietnamese-speaking Catholics. Another delegate, when asked, spoke of his work as a teacher. Benedict, a longtime academic, perked up at that. "What do you like to teach?" he asked. Then a man representing Australia's aborigines -- his chair was decorated with a kangaroo skin -- said he hoped to inspire other indigenous peoples. "That all of us had a struggle, a conversion or a transformation -- and that all of us had a desire to help other people," Cervantes said. The conversation was held mostly in English, but the pope switched to Spanish and French at times. With a Korean man to his right, he spoke in German. Benedict was like "a grandfather trying to get know about his grandchildren," Cervantes said. The diners took a break for the pope to see some gifts each person brought. Cervantes and his youth groups wanted to give the pope something classically American, so he brought a basket with assorted gifts. Among the items was a book of blessings from the U.S. Conference of Catholic Bishops. In a nod to baseball, there was an Angels visor. There was also an orange stress ball, the kind overworked people like to squeeze to relieve tension. "What is this?" Benedict asked. Cervantes explained, prompting a laugh. "Seeing him smile and seeing him laugh was worth it," he said. Then came the classic Orange County gift: A Mickey Mouse hat. As any kid knows, it has to have your name on it. So embroidered between the ears was "Benedict XVI." But Cervantes had a serious message for the pope as well: "There is hope and there is faith in the U.S."
Two days after the lunch, Benedict delivered a homily during a Mass held at the Randwick Racecourse in Sydney. "The Church especially needs the gifts of young people, all young people," he told the crowd. "She needs to grow in the power of the Spirit who even now gives joy to your youth and inspires you to serve the Lord with gladness." The homily hit home for Cervantes. "This is a person who truly cares, who lives what he preaches," he said. In the weeks following his lunch with the pope, Cervantes has reflected on the experience -- "It's definitely given me more inner strength" -- and has realized that what surprised him then makes sense now. "His writings talk about making personal connections," he said. That explains all the questions about family and personal journeys. And why the pope didn't really say much himself. "He's a very good listener," Cervantes said. "You're used to seeing him take charge." But with the young people, he "just was listening to us." The Pope prays for all of those, "and they are many", who write to him about their difficulties: Benedict XVI reminds them, and all Christians, that "those who pray never lose hope, not even in difficult situations, even situations that are desperate in human terms. This is what the Church's history teaches us", and this is what is displayed by the witness of the martyrs, like Edith Stein and Maximilian Kolbe, whose feasts are celebrated in this period. "In human terms, their lives could be viewed as a failure, but in their martyrdom shines the splendor of love". The commemoration of the two martyrs killed at Auschwitz by the Nazis was at the center of the remarks that Benedict XVI addressed to about 8,000 people gathered in the courtyard of the apostolic residence in Castel Gandolfo for the resumption of the general audiences, after the hiatus due to the pope's visit to Australia and his vacation in Brixen. The audiences have not been held at Castel Gandolfo since the pontificate of Paul VI, 30 years ago. 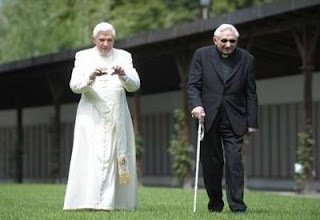 Benedict XVI looked relaxed after his days spent in the mountains, and he talked about the "serenity" there, and thanked those who "took care of" his vacation. "There are very many", he then said, "who write to me asking me to pray for them, and they do not conceal their concerns, their problems, aspirations, and hopes which they carry in their hearts together with the uncertainties through which humanity is living in this period. I can assure all", he added, "that I remember you in my prayers, especially in the celebration of the Holy Mass and the recitation of the Rosary". "How very often", he commented, "it has been prayer that has sustained the Christian people in their trials". In this regard, he cited Edith Stein and Maximilian Kolbe, whose feasts are celebrated in this period: "both concluded their earthly existence with martyrdom in Auschwitz. In human terms, their lives could seem like a defeat, but they are instead proof of the victory of love. As Saint Maximilian Kolbe said, 'hatred is not a creative force, only love is', and the proof of love was his generous offering of himself to take the place of [a fellow prisoner sentenced to death]". On August 6, Edith Stein, three days from her dramatic end, approached some of her fellow sisters and told them she was "ready for anything. Jesus is also here. So far I have been able to pray, and I have said Ave Crux". Survivors of the concentration camp, the pope said, have recounted that, dressed in the habit of her order, she distinguished herself by her behavior: "prayer was the secret of this saint, a co-patroness of Europe". And "Ave Maria was the final invocation of Saint Maximilian Kolbe as he held out his arm to the man who killed him by injection". "As we prepare ourselves to celebrate the solemnity of the Assumption", he concluded, "let us again entrust ourselves to her who looks upon us at every moment from heaven, with maternal love". 1. "All great works of art are an epiphany of God"
Q: Holy Father, my name is Willibald Hopfgartner, and I am a Franciscan. In your address in Regensburg, you emphasized the substantial connection between the divine Spirit and human reason. On the other hand, you have also always emphasized the importance of art and beauty. So then, together with conceptual dialogue about God in theology, should there not always be a new presentation of the aesthetic experience of the faith within the Church, through proclamation and the liturgy? A: Yes, I think that the two things go together: reason, precision, honesty in the reflection on truth, and beauty. A form of reason that in any way wanted to strip itself of beauty would be depleted, it would be blind. Only when the two are united do they form the whole, and this union is important precisely for the faith. Faith must constantly confront the challenges of the mindset of this age, so that it may not seem a sort of irrational mythology that we keep alive, but may truly be an answer to the great questions; so that it may not be merely a habit, but the truth, as Tertullian once said. In his first letter, St. Peter wrote the phrase that the medieval theologians took as the legitimization, almost as the mandate for their theological work: "Always be ready to give an explanation to anyone who asks you for a reason for your hope" – an apologia for the "logos" of hope, meaning a transformation of the "logos," the reason for hope, into an apologia, an answer addressed to men. He was clearly convinced of the fact that faith is "logos," that it is a form of reason, a light issuing from the creating Light, and not a hodgepodge resulting from our own thought. This is why it is universal, and for this reason it can be communicated to all. But this creating "Logos" is not a merely technical "logos." It is broader than this, it is a "logos" that is love, and therefore to be expressed in beauty and goodness. And in reality, for me art and the saints are the greatest apologia for our faith. The arguments presented by reason are absolutely important and indispensable, but there always remains some disagreement somewhere. If, instead, we look at the saints, this great luminous arc that God has set across history, we see that here there is truly a power of goodness that lasts over the millennia, here there is truly light from light. And in the same way, if we contemplate the created beauties of the faith, these simply are, I would say, the living proof of faith. Take this beautiful cathedral: it is a living proclamation! It speaks to us on its own, and beginning with the beauty of the cathedral we are able to proclaim in a visible way God, Christ and all of his mysteries: here these have taken shape, and are gazing back at us. All of the great works of art, the cathedrals – the Gothic cathedrals, and the splendid Baroque churches – all of them are a luminous sign of God, and therefore truly a manifestation, an epiphany of God. Christianity involves precisely this epiphany: that God has become a veiled Epiphany, he appears and shines. We have just listened to the sound of the organ in all its splendor, and I think that the great music born within the Church is an audible and perceptible rendering of the truth of our faith: from Gregorian chant to the music of the cathedrals to Palestrina and his era, to Bach and then to Mozart and Bruckner, and so on... Listening to all of these great works – the Passions by Bach, his Mass in B minor, and the great spiritual compositions of 16th century polyphony, of the Viennese school, of all of this music, even by minor composers – suddenly we feel: it is true! Wherever things like these are created, there is Truth. Without an intuition capable of discovering the true creative center of the world, this beauty cannot be created. For this reason, I think that we must always act in such a way that these two things go together, we must present them together. When, in our own time, we discuss the reasonableness of the faith, we are discussing precisely the fact that reason does not end where experimental discoveries end, it does not end in positivism; the theory of evolution sees the truth, but sees only half of it: it does not see that behind this is the Spirit of creation. We are fighting for the expansion of reason, and therefore for a form of reason that, exactly to the point, is open to beauty as well, and does not have to leave it aside as something completely different and irrational. Christian art is a rational form of art – we think of Gothic art, great music, or the Baroque art right here – but this is the artistic expression of a much broader form of reason, in which the heart and reason come together. This is the point. This, I think, is in some way the proof of the truth of Christianity: the heart and reason come together, beauty and truth touch. And to the extent that we are able to live in the beauty of truth, so much more will faith again be able to be creative, in our own time as well, and to express itself in a convincing artistic form. 2. "The earth is waiting for men who will care for it as the work of the Creator"
Q: Holy Father, my name is Karl Golser, I am a professor of moral theology in Brixen, and also director of the institute for justice, peace, and the safeguarding of creation. I enjoy remembering the time when I was able to work with you at the congregation for the doctrine of the faith. [...] What can we do to bring a greater sense of responsibility toward creation into the life of the Christian communities? How can we arrive at seeing creation and redemption increasingly as a whole? A: I also think that there must be new emphasis on the unbreakable bond between creation and redemption. In recent decades, the doctrine on creation had almost disappeared from theology, it was almost imperceptible. Now we are aware of the damage that this causes. The Redeemer is the Creator, and if we do not proclaim God in his total greatness – as Creator and as Redeemer – we also deprive redemption of value. In fact, if God has nothing to say in creation, if he is simply relegated to being part of history, how can he really understand our entire life? How can he truly bring salvation to man in his entirety, and to the world as a whole? This is why, for me, the renewal of doctrine on creation and a new understanding of the inseparability of creation and redemption are extremely important. We must recognize again: He is the "Creator Spiritus," the Reason that is in the beginning and from which everything is born, and of which our own reason is nothing but a spark. And it is He, the Creator himself, who also entered into history and is able to enter into history and act within it precisely because He is the God of the whole, and not only of a part. If we recognize this, it obviously follows that redemption, being Christians, or simply the Christian faith always and in any case mean responsibility toward creation. Twenty or thirty years ago, Christians were accused – I don't know whether this accusation is still maintained – of being the real ones responsible for the destruction of creation, because the words contained in Genesis – "Subdue the earth" – were thought to have led to this arrogance toward creation, the consequences of which we are experiencing today. I think that we must again learn to understand this accusation in all its falsehood: as long as the earth was considered the creation of God, the task of "subduing it" was never understood as an order to enslave it, but rather as the task of being guardians of creation and of developing its gifts; of actively cooperating in God's work, in the evolution that He set in motion in the world, so that the gifts of creation may be treasured instead of trampled upon and destroyed. If we observe what was born around the monasteries, how little paradises, oases of creation, were born and continue to be born in those places, it becomes evident that all of this is not only a matter of words, but wherever the Word of the Creator has been understood correctly, where life has been lived together with the Creator and Redeemer, there one finds efforts to protect creation, and not to destroy it. Chapter 8 of the letter to the Romans also fits into this context, where it says that creation suffers and groans because of the subjection in which it finds itself as it awaits the revelation of the children of God: it will feel free when creatures, when men come who are children of God and will treat it beginning from God. I believe that this is precisely the reality that we are witnessing today: creation is groaning – we can perceive this, we can almost hear it – and is waiting for human persons to look at it from God's standpoint. The brutal consumption of creation begins where God is not, where the material has become only material for us, where we ourselves are the ultimate standard, where everything is simply our property, and we consume it only for ourselves. And the waste of creation begins where we no longer recognize any standard above ourselves, but see only ourselves; it begins where there no longer exists any dimension of life beyond death, where we must hoard everything in this life and possess life in the maximum intensity possible, where we must possess everything it is possible to possess. I believe, therefore, that real and efficient measures against the waste and destruction of creation can be realized and developed, understood and lived only where creation is considered from the standpoint of God; where life is considered beginning from God, and has greater dimensions – in responsibility before God – and one day will be given to us by God in its fullness, and never taken away: by giving life away, we receive it. Thus, I believe, we must try by every means at our disposal to present the faith in public, especially where there is an existing sensitivity toward it. And I think that the sensation that the world may be slipping away from us – because we ourselves are driving it away – and the sense of being oppressed by the problems of creation, precisely this gives us the right opportunity in which our faith can speak publicly and be considered as a constructive contribution. In fact, this is not a matter of simply finding technologies to prevent damage, although it is important to find alternative sources of energy and other such things. All of this will not be enough if we ourselves do not find a new lifestyle, a discipline that includes sacrifice, the discipline of acknowledging others, to whom creation belongs just as much as it does to us who are able to make use of it more easily; a discipline of responsibility toward the future of others and toward our own future, because it is responsibility before Him who is our Judge, and who as Judge is our Redeemer, but is also truly our Judge. I therefore think that it is necessary, in any case, to put these two dimensions together – creation and redemption, earthly life and eternal life, responsibility toward creation and responsibility toward others and toward the future – and that it is our task to participate to this effect in a clear and decisive manner in public opinion. In order to be listened to, we must at the same time demonstrate by our own example, with our own lifestyle, that we are speaking about a message in which we ourselves believe, and according to which it is possible to live. And we want to ask the Lord to help us all to live the faith, the responsibility for the faith, in such a way that our lifestyle becomes a witness, and then to speak in such a way that our words are credible messengers of faith as guidance for our time. There is little doubt that what makes Amazon so competitive with bricks and mortar bookstores is Amazon Prime. If you order a lot of books it is worth the price--you get them mailed to you in two days and sometimes, in my experience they even arrive in one! Science uncovers some interesting facts--its good for you! Religious leaders have contended for millennia that burning incense is good for the soul. Now, biologists have learned that it is good for our brains too. An international team of scientists, including researchers from Johns Hopkins University and the Hebrew University in Jerusalem, describe how burning frankincense (resin from the Boswellia plant) activates poorly understood ion channels in the brain to alleviate anxiety or depression. This suggests that an entirely new class of depression and anxiety drugs might be right under our noses. "In spite of information stemming from ancient texts, constituents of Bosweilla had not been investigated for psychoactivity," said Raphael Mechoulam, one of the research study's co-authors. "We found that incensole acetate, a Boswellia resin constituent, when tested in mice lowers anxiety and causes antidepressive-like behavior. Apparently, most present day worshipers assume that incense burning has only a symbolic meaning." To determine incense's psychoactive effects, the researchers administered incensole acetate to mice. They found that the compound significantly affected areas in brain areas known to be involved in emotions as well as in nerve circuits that are affected by current anxiety and depression drugs. Specifically, incensole acetate activated a protein called TRPV3, which is present in mammalian brains and also known to play a role in the perception of warmth of the skin. When mice bred without this protein were exposed to incensole acetate, the compound had no effect on their brains. Check out the Diocese of Birmingham's Life site. July 22nd Who Was Saint Mary Magdalene? 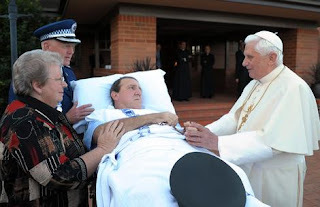 A TERMINALLY ill police officer blessed by Pope Benedict before World Youth Day celebrations died in a Lismore hospital yesterday morning after a prolonged illness. Senior Constable Gary Hill, who battled skin cancer, heart and brain tumours for the past four years, was known for his commitment to his 22-year police career and faith, the Richmond Local Area Commander, Superintendent Bruce Lyons, said. "It was not uncommon for Gary to go and have chemotherapy in the morning and come back to work in the afternoon. I'm sure that faith kept him going." When Senior Constable Hill had a seizure at work two weeks ago, he told his colleagues he would visit the doctor after he finished his shift. Instead he was taken to hospital and then to palliative care when it was discovered a cluster of small tumours in his brain had returned. Superintendent Lyons said it had been his dying wish to see the Pope: "Gary always wanted to go to Rome and stand in a crowd of 50,000 people and see the Pope come out on the balcony." Colleagues arranged for a meeting with the pontiff during his retreat at Kenthurst last week, where he blessed the police officer and gave him rosary beads. The pontiff was given the policeman's hat after he donned it for the cameras, mistakenly taking it for an akubra he had been told had been brought along as a gift. In the beautiful prayer that we are about to recite, we reflect on Mary as a young woman, receiving the Lord’s summons to dedicate her life to him in a very particular way, a way that would involve the generous gift of herself, her womanhood, her motherhood. Imagine how she must have felt. She was filled with apprehension, utterly overwhelmed at the prospect that lay before her. The angel understood her anxiety and immediately sought to reassure her. “Do not be afraid, Mary …. The Holy Spirit will come upon you and the power of the Most High will overshadow you” (Lk 1:30, 35). It was the Spirit who gave her the strength and courage to respond to the Lord’s call. It was the Spirit who helped her to understand the great mystery that was to be accomplished through her. It was the Spirit who enfolded her with his love and enabled her to conceive the Son of God in her womb. This scene is perhaps the pivotal moment in the history of God’s relationship with his people. During the Old Testament, God revealed himself partially, gradually, as we all do in our personal relationships. It took time for the chosen people to develop their relationship with God. The Covenant with Israel was like a period of courtship, a long engagement. Then came the definitive moment, the moment of marriage, the establishment of a new and everlasting covenant. As Mary stood before the Lord, she represented the whole of humanity. In the angel’s message, it was as if God made a marriage proposal to the human race. And in our name, Mary said yes. In fairy tales, the story ends there, and all “live happily ever after”. In real life it is not so simple. For Mary there were many struggles ahead, as she lived out the consequences of the “yes” that she had given to the Lord. Simeon prophesied that a sword would pierce her heart. When Jesus was twelve years old, she experienced every parent’s worst nightmare when, for three days, the child went missing. And after his public ministry, she suffered the agony of witnessing his crucifixion and death. Throughout her trials she remained faithful to her promise, sustained by the Spirit of fortitude. And she was gloriously rewarded. Dear young people, we too must remain faithful to the “yes” that we have given to the Lord’s offer of friendship. We know that he will never abandon us. We know that he will always sustain us through the gifts of the Spirit. Mary accepted the Lord’s “proposal” in our name. So let us turn to her and ask her to guide us as we struggle to remain faithful to the life-giving relationship that God has established with each one of us. She is our example and our inspiration, she intercedes for us with her Son, and with a mother’s love she shields us from harm.